About Things you didn't know you want to know about me. Ryvr Jones is my pen name. And yet, I’ve been Nospheratt for so long, it’s part of my identity. 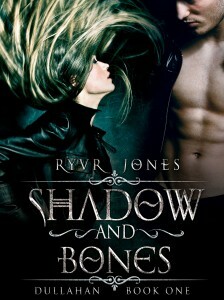 Want to read the first three chapters of Shadows and Bones? Sign up to receive book release news and cool stuff. 2. Blogger. Sometimes poet. Philosopher at improper hours. 3. [Informal] Opiniology scholar. Sarcasm hobbyist. 4. [Origin] Mix of cultures, nationalities, regions and languages. 5. [Archaic] Person born in the year Star Wars premiered, and who shares her birthday with Freddie Mercury. 6. Geek, in case you didn’t notice. Life unfolds in the stories we tell. I have plenty of stories to tell; since we’re on my “About” page, I think it’s appropriate to tell you a story about me, right? I tell stories since I learned to talk. Since before learning to write – I used to dictate my tales to my parents, and I still have some of those scribbles. Once I learned to write, I began to amass a mountain of paper (at the time, where I lived, computers and Internet only existed in science fiction movies). A mountain that keeps getting taller, by the way. I think it will eventually achieve mountain range status. The stories grew with me: children’s stories, poems, love letters, blog posts, and eventually, books. I wrote my first book when I was seventeen. It was written by hand in a notebook, because I didn’t have a typewriter. It was awful (I still have it! ), but at the time I didn’t know that, of course. I finished it and let it sit for years. When I was in my early twenties, I wrote a new book, very loosely based on the first one. Both books were fantasy romance, in a vaguely medieval setting. The second one was a lot better than the first, but I still didn’t know anything about writing craft. Nothing. I thought the book was perfect. Today I know it has potential, but it’s a hot mess. Then I remembered Rhys. He was one of my favorite characters from my second-not-good-novel, so I decided I was going to tell his story. Thus, the Dullahan series was born. And I’ll never stop writing again. Hi! I’m Ryvr Jones/Nospheratt. I write romance books. Subscribe to my newsletter and I’ll send you the first three chapters of Shadow and Bones. Of me and the rain. In the leaves of red fall. And to which I belong. And the darkness above us. Copyright © 2019 Ryvr Jones.